1920s | Oh, The Glamourous Life! In the 1920s having a home freezer showed you were awfully up-to-date *and* well-to-do. So, frozen foods became a fad to show off when entertaining. Now, I don’t mean something frozen that you’d heat up before serving. These are dishes that were served frozen. And not just ice cream — I’m talking about frozen salads. Frozen chicken salad and frozen tomato salad were pretty popular. I even saw a recipe that directed the busy cook to simply freeze a can of tomato juice and then slice off thin rounds (which were presumable served on lettuce and garnished with a dollop of mayo). Betty gave me a charming little volume called Salads and Sandwiches, which was published by the Woman’s Institute of Domestic Arts and Sciences in 1929. It’s chockfull of dainty little dishes just right for a ladies’ tea party. And one of them was Frozen Fruit Salad. I just had to make it. Frozen fruit salads were very popular in the ’20s but persisted well into the 1950s. 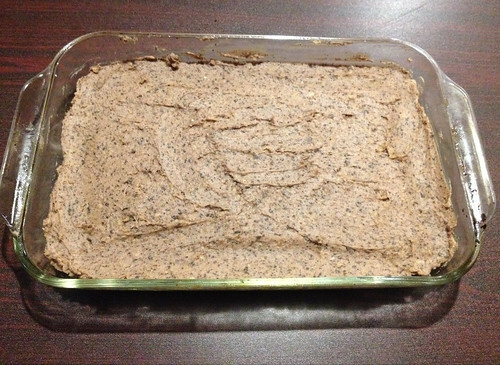 I made a half recipe (1 quart), just in case it turned out awful, and brought it to a party, since even a half recipe makes more than the denizens of Stately Babydoll Manor want. First you need to make fruit salad dressing, which is equal parts pineapple, peach, or pear juice and orange juice (I used pineapple-orange juice because it was in the fridge and mighty convenient), some lemon juice, a little sugar, and a beaten egg, all cooked in a double boiler. You’re supposed to give it “a few turns with a rotary egg beater”, but lacking that piece of kitchen equipment, I used a whisk. While the dressing is cooling, chop up some nut meats (I used a mix of toasted walnuts, pecans, and almonds), dates (I used medjool dates and they kind of mushed into a paste when I chopped them), maraschino cherries, and pineapple (canned, of course!). Whip some cream. Then beat cream cheese and mix in the dressing. Again, the whisk was the right tool. Then fold in the fruit and then the cream. Spoon it into a mold. I don’t actually have any decorative molds (Really? Why do I not have any fancy molds? ), so I used a metal mixing bowl. Then you’re supposed to seal the mold with adhesive tape or a strip of cloth soaked in paraffin and pack it in ice and salt for 4 hours. I just covered the bowl tightly and stuck it in the freezer. It was sweet and creamy and I wouldn’t call this a salad in the least. 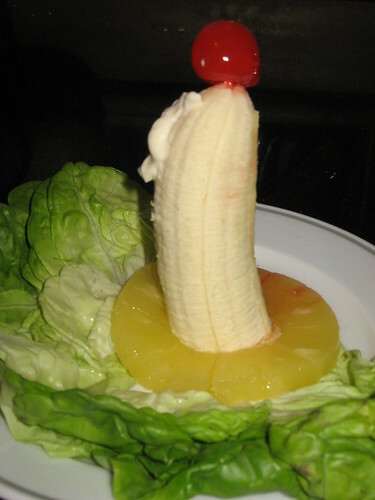 The Woman’s Institute does say that some fruit salads can be served as both salad course and dessert. And this certainly falls into that category. I was told it tasted “pink”, “ice cream-ish”, and “1950’s”. Almost all was eaten, so I’d call that a success. Combine juices. Add sugar. Add egg. Cook in a double boiler until mixture thickens slightly. Remove from heat and beat briefly. Allow to cool. Meanwhile, beat the cream cheese until creamy. Whip cream until stiff. Add fruit juice mixture to cream cheese. 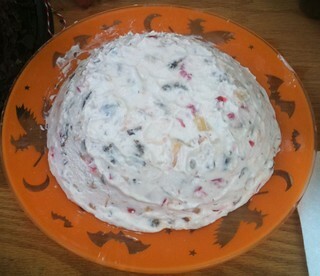 Fold in fruit and nuts, then fold in whipped cream. Spoon into 1-quart metal mold. Cover tightly with plastic wrap, then aluminum foil. Freeze for at least 4 hours. To unmold, remove wrap & foil, dip mold briefly in hot water, then place serving platter on top and invert everything. Note: Add 1/2 cup chopped kumquats, 2 Tablespoons chopped preserved ginger, and use almonds for the nuts and you’ll have Oriental Frozen Fruit Salad. I did a little cooking yesterday, and, among other items, made a classic fruit salad. This one, although popular in the 1950’s, has its origins in the 1920’s. 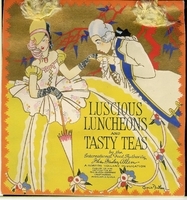 The salad is quite whimsical in its design, which was typical of ladies’ “dainty” luncheon dishes. 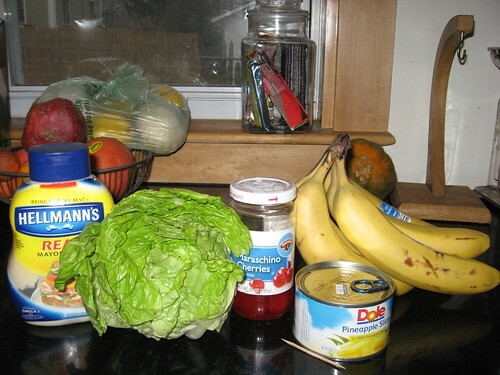 Take your ingredients: lettuce leaves, canned pineapple rings, bananas, maraschino cherries, and mayonnaise. There was a bit of a tropical fruit craze in the ’20’s, probably promoted by Dole, which was the main importer of pineapple (canned, of course) and bananas from Hawaii to the mainland. Maraschino cherries (the neon red kind) are also a product of the 1920’s. The assembly of this salad is key. 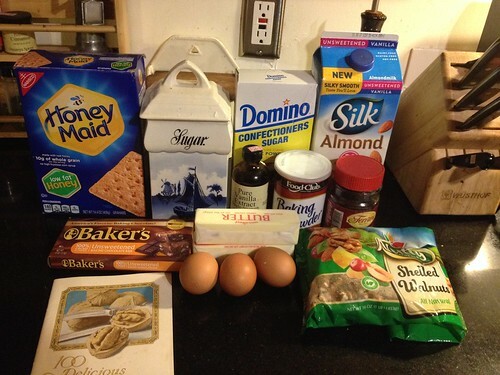 You need to properly present all the ingredients or the impact is lost. A toothpick or two can help with the architecture. Don’t forget that this was commonly served at ladies’ luncheons, so you want to make sure the shape is instantly recognizable. Isn’t that clever! A pineapple ring candle holder, a banana candle, a cherry flame, and mayonnaise wax!